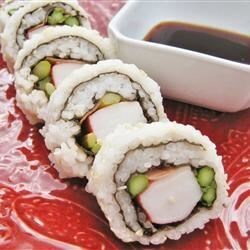 "California Roll - it's really good. Serve with soy sauce and wasabi. " Way too much mayonnaise ratio to finely chopped crabmeat. It drowned out the crabmeat taste. Instead of 1/4 cup mayo, I'd put 1-1.5 tbsp for 1/2 a cup of crabmeat. delish, if you have not tried this recipe......try it. Sushi doesn't have mayonnaise. You could also substitute another vegetable instead of avocado and only use one; two is a bit much.